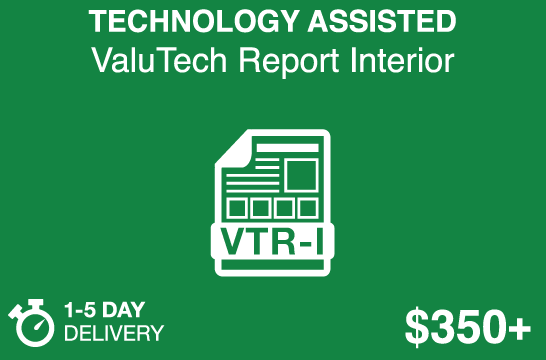 Valuation Technology Introducing Technology Assisted Home Appraisals. to create a whole new valuation process and suite of valuation alternatives that provide a better value. Save time & money with more cost-effective options. 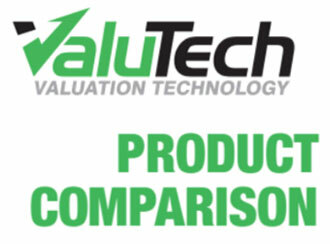 We utilize a database-driven valuation platform and a perpetual process to dramatically reduce appraisal development times thru automation, to produce analytics and research not previously possible and to create innovative, new valuations products. 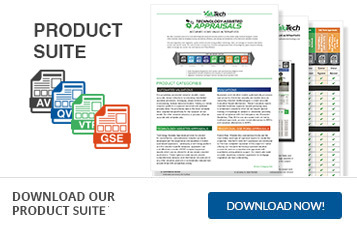 Designed to meet regulatory requirements while streamlining the development process to provide options at various price points, delivery times and content allowing you to choose the reports which best meet your needs. 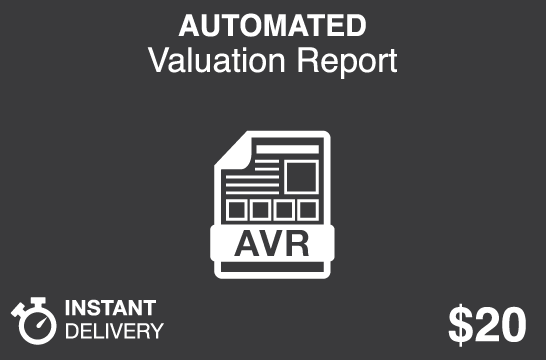 The AVR report leverages valuation algorithms and proprietary real estate data to produce an accurate, instant valuation. 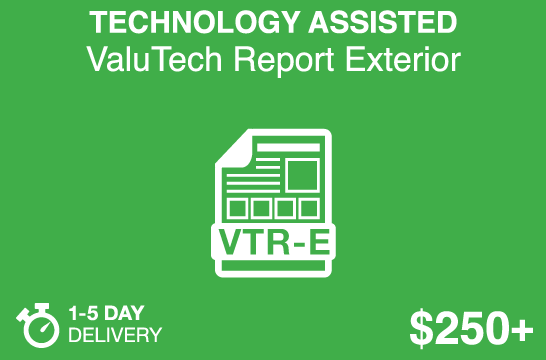 The QVR report is created utilizing ValuTech’s innovative database-driven valuation process to produce a condition-based, automated evaluation report that complies with the interagency guidelines. 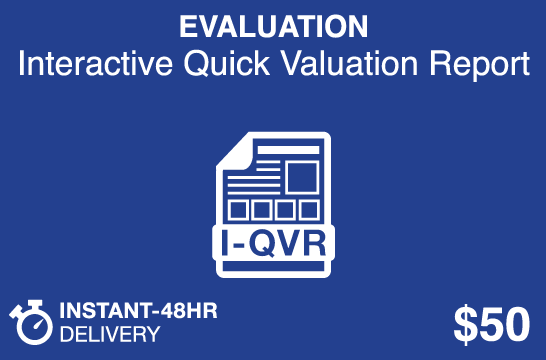 The Interactive QVR combines the local market expertise of an appraiser with the analytic capacity of our valuation models to produce a reliable, appraiser-assisted, semi-instant evaluation. 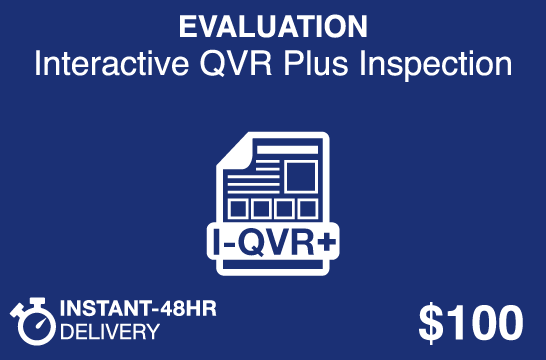 The interactive QVR enhanced with the compliance and credibility gained with an exterior inspection. The inspection results and appraiser selected comparables fuel valuation models to produce a condition-based evaluation designed to meet the requirements of the IAG. The Desktop Appraisal Report meets the need for a lower cost, quick turnaround, appraiser-derived opinion of market value based the sales comparison approach. For fast access to the expertise and knowledge of an appraiser. Based on the appraiser’s exterior view of the subject, the comparables and neighborhood, it provides a regulatory compliant appraisal in a concise format. An accurate alternative to BPO’s; 3rd party inspected valuations or a cost-effective alternative to a GSE drive-by appraisal. The Interior Appraisal Report leverages technology, eliminates inefficiencies and perpetuates expertise to produce a professionally developed appraisal alternative. 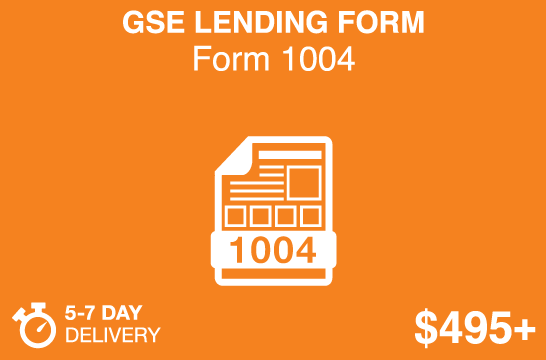 For all appraisal applications, outside of GSE loan origination. The 2055 & 2075 GSE Form appraisals are exterior-inspection based valuations used for a single-family residential properties and condominiums. Typically, used by regulated institutions for home equity lines of credit. The 1004 and 1073 GSE Forms are the most widely used appraisal reports for residential properties developed with an interior inspection. Used for mortgage origination and loan underwriting for loans being sold to the GSE’s (Fannie Mae / Freddie Mac). 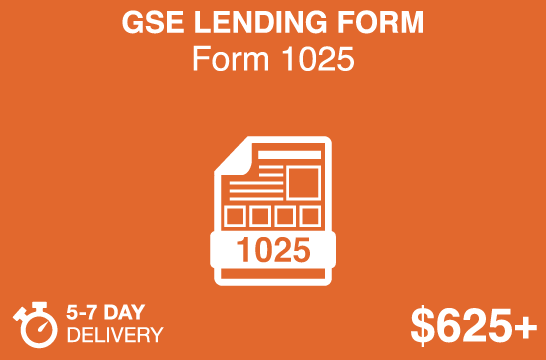 The 1025 GSE Appraisal Form is used for multi-unit residential properties; based on interior inspections and three approaches to value. Used for mortgage origination and loan underwriting for loans being sold to the GSE’s (Fannie Mae / Freddie Mac). Use case scenarios and report selection considerations based on property type, neighborhood type and available information. An automated valuation that works best for properties in conforming areas with lots of similar homes and consistent property values. It is less ideal for neighborhoods with a broad mix of homes and values or with characteristics like views, golf course frontage and acreage. An instant evaluation which also works best conforming and active markets with more uniform or similar properties. It contains pictures of the properties so the reader can see if the comparables selected are similar in appeal; includes and a confidence score to assist in determining its reliability. This semi-instant evaluation report where an appraiser with neighborhood expertise selects appropriate comparables for the valuation models to evaluate. This interaction improves accuracy and credibility. A better entry-level option for all properties especially ones in more diverse and less active neighborhoods. This step-up evaluation incorporates the appraiser viewing the property before selecting the comparables which further elevates the reliability and compliance of the report. It allows for verification of important property attributes and other external influences. The more reliable of the evaluation report options for all property types. The appraiser preforms their analysis relying on data from numerous sources; but, does not view the property. Most suitable when there is an abundance of property information from reliable sources like previous appraisals, MLS listings or a homeowner questionnaire. More ideal for properties which are not unique or have attributes like views, extensive site improvements, high-end finishes or architectural significance. This appraisal is used to validate property attributes from the exterior when interior access is not available, in the cases of retrospective appraisals, if the property is no longer owned or is materially different from the requested effective date. Can be used of all property and market types. A complete analysis appraisal with interior verification of the dwelling size and property attributes. Provides the most comprehensive valuation which can be utilized for all property types, market conditions and for all valuation applications. 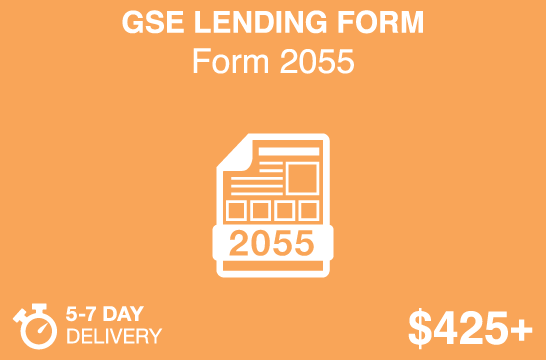 Lending report option based on exterior inspection and the reliance on secondary data sources. Can be used on all property types and more ideal when property interior condition, quality and views are typical and consistent with the neighborhood. The most common lending appraisal format based on an interior and exterior view of the property. They can be used for all property types an in all market conditions. 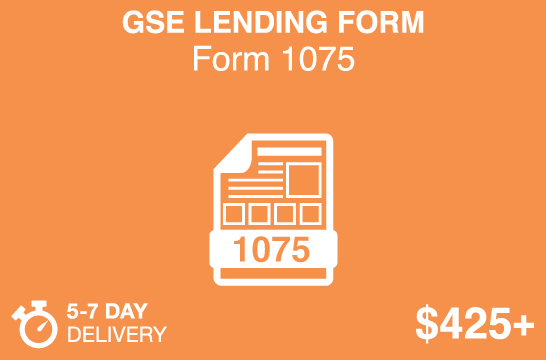 Used only for mortgage originations and lender applications. A mortgage origination appraisal format used for multi-unit residential properties for 2 to 4 units. Can be used for all residential income properties and in all market conditions. Use case scenarios for the appropriate report selection based on risk, LTV, compliance, and application considerations. A preliminary instant valuation to pre-screen a property value and valuation need; compliment the QC process; obtain asset disposition values or monitor the value of a single property or an entire portfolio. A step-up evaluation where an appraiser with market expertise selects the comparables for improved accuracy and reliability. Use to underwrite low-risk, home equity loans; obtain second opinion valuations; for loan servicing; or obtain more credible preliminary values. An enhanced evaluation where the appraiser views the property and selects the comparables for ensured compliance and improved credibility. Used for transactions that qualify for the appraisal threshold exemption or subsequent transaction exemptions; HELOCs & Second trust deeds; second opinion valuations; quality control; loan servicing; asset management; and loan disposition. A desktop appraisal providing fast and cost-effective access to the knowledge and expertise of an appraiser. These USPAP complaint appraisals can be used for all valuation applications including home equity loans; second opinion valuations; pre-listing appraisals; retrospective appraisals; quality control; and loan servicing. The Interior Evaluation Report breaks the chains and limitations of GSE Form appraisal reports and can be used for any property valuation application. These appraisals are developed by a market expert leveraging technology to produce a comprehensive, cost-effective, USPAP complaint appraisal alternative. Lending form appraisals based on an exterior inspection and used for condominium units and single-family residential properties. Typically, used by regulated institutions and lenders for loan origination of low LTV firsts, second trust deed loans and home equity lines of credit. The most common appraisal report format for single-family residential properties based on an interior and exterior inspection. Developed by an expert appraiser utilizing our technology-assisted valuation platform. For clients who want an accurate, regulatory compliant appraisal for mortgage origination and loan underwriting. Small Residential Income Property Appraisal Report used for the valuation of two-to-four unit residential properties. Developed utilizing our technology platform to produce comprehensive, accurate, regulatory compliant appraisals for mortgage origination and loan underwriting. What’s the difference between Automated & Appraiser Developed? Automated values are derived from a computer-driven model that calculates a value base on an appraiser prescribed process. Appraiser Developed means an appraiser derives the value applying standard appraisal techniques. Does Instant mean I get a report while checking out? Yes, instant means your get the results immediately. Our other reports have quick deliveries; however, they require appraiser involvement which requires more time to develop. The AVR is only $20, why wouldn’t I order it? The AVR is a great report. It is an excellent choice when you need an initial indication of value quickly or in a low risk transaction. It works very well in conforming areas; however, it is less ideal when a highly accurate value is needed or if the property is unique or if the neighborhood is very diverse. What is compliant with USPAP and IAG mean? USPAP is the Uniform Standards of Professional Appraisal Practice which sets the legal standards all appraisers must comply with. IAG is the Interagency Guidelines which establish regulations that all banks and credit unions must comply with pertaining to lending and appraisals requirements. Why does the accuracy vary? The confidence score indicates the potential variance between the indicated value and the potential values. The accuracy varies mostly due to the appraiser’s involvement in the process or due to the uniqueness of the property, unknown variables and market characteristics. What’s the difference in content? The content or information contained in the reports increase as you move up the scale. For some needs detail content is not required in a report and just a value indication and the necessary information required for compliance is needed. The QVR has a Sales Grid & Photos, why is that important? 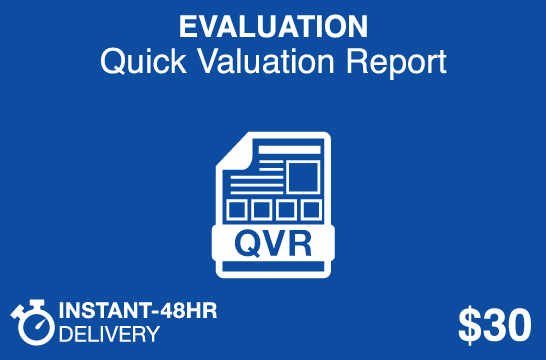 The QVR reports are designed with a sales comparison grid and property photos, so that the reader can see how the value was derived and judge the relevance of the comparables and the credibility of the value. It is a data rich report used by banks, credit unions and lenders for compliance with regulations. 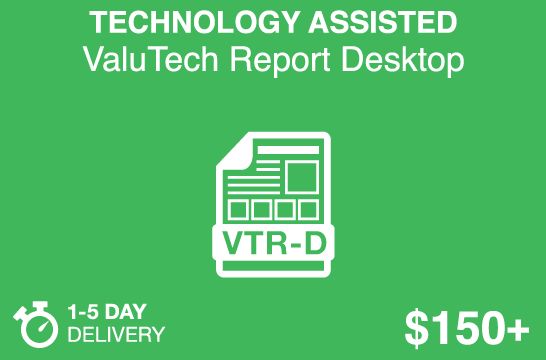 Why are the Technology Assisted Reports considered the best value? These reports offer a high level of accuracy and compliance at lower costs than traditional appraisals. Our appraisers leverage technology to more accurately and efficiently develop appraisal reports which are data rich, standardized formats and compliant.